The word ?ulcer? refers to a sore. Ulcers are sores in the stomach (gastric ulcer) or upper part of the intestines (duodenal ulcer). They?re caused by stomach acid that wears away at the stomach or intestinal lining. Most people who develop ulcers don?t have any symptoms at first. When ulcer symptoms do begin, they usually involve pain in the upper part of the abdomen. The pain may feel dull, and it can come and go or persist for days or weeks. Sometimes eating relieves the abdominal pain, and sometimes food makes it worse. Other ulcer symptoms include bloating, a feeling of fullness, nausea, and vomiting. The most serious ulcer symptoms are due to bleeding. A bleeding ulcer can cause anemia, which produces symptoms such as fatigue, pale skin, and shortness of breath. Bleeding in the stomach and intestines can cause a person to vomit blood or a substance that resembles coffee grounds, or to have bloody diarrhea or severe stomach pain. 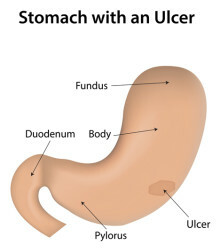 These ulcer symptoms are indications that there is a hole in the stomach or intestines, or a blockage in the stomach. If you notice any of these symptoms, call 911 or go to a hospital right away for treatment. To diagnose an ulcer, the doctor may do an esophagogastroduodenoscopy (EGD), in which a flexible tube with a camera on the end is inserted into the mouth and lowered to let the doctor see the stomach and beginning of the small intestine. An upper GI series, which involves x-rays of the esophagus and stomach after drinking barium, may also be done. Ulcers are treated with proton pump inhibitors or H2 blockers?two medicines that reduce stomach acid production. 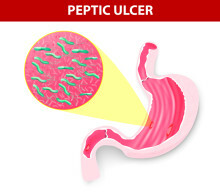 Often, ulcers are caused by an infection with H. pylori bacteria. Antibiotics can treat this infection. Peptic ulcer disease affects about 6 million Americans each year, according to the Centers for Disease Control and Prevention (CDC). CDC data also shows that older adults are at greater risk for hospitalization due to peptic ulcer disease.